Purchase your tickets by Wednesday, Nov. 11, for the package deal that includes a pre-game event and transportation to the game in Waco. The pre-game tipoff features food, activities, and a pep rally 1:30-3 p.m. at Moritz Plaza at College Park Center. Buses leave for the game at 3 p.m. The game starts at 6 p.m.
Tickets are $15 for students and $30 for faculty, staff, and alumni. Price includes the game ticket, food, a T-shirt, and transportation to and from the game. 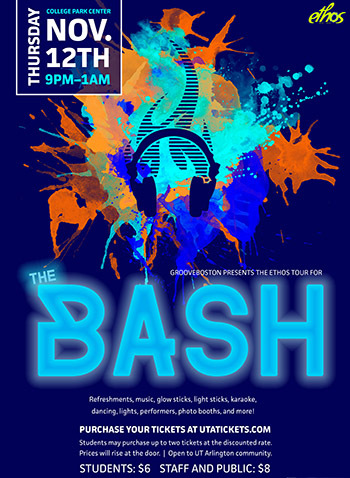 Tickets are available at uta.edu/homecoming along with other details about Homecoming 2015. If you drive yourself to the game, individual tickets are $5-10. Don't forget to claim your tickets to see the Homecoming men’s basketball game against Fordham at 7:30 p.m. Saturday, Nov. 14, at College Park Center. Tickets are $3 with student ID at utatickets.com. 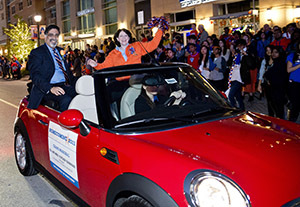 Read about the pre-game Homecoming events at uta.edu/homecoming. 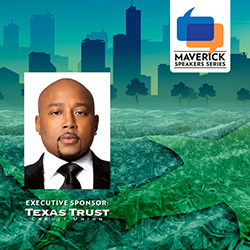 John will speak on "Shark Tank Entrepreneurship" at 7:30 p.m. Tuesday, Nov. 10, at College Park Center. An audience question-and-answer session and book signing will follow. The College of Science celebrates Science Week through Friday, Nov. 6, as part of the college’s 50th anniversary. Science Week will feature lectures and panel discussions on careers in the medical and environmental science fields featuring alumni and industry professionals and a Planetarium program featuring M.J. Tykoski, an award-winning Metroplex schoolteacher who will share her story of flying on NASA’s Stratospheric Observatory for Infrared Astronomy (SOFIA). Science Week is an annual event designed to put a spotlight on the achievements of the College of Science’s alumni, students, and faculty and to allow students to interact with alumni and benefit from their experience. See the full Science Week schedule. In 1965—the year Arlington State College joined the UT System and became UTA—the College of Science became a separate academic unit. Read about the college's research and projects in the Maverick Science magazine. Arlington Mayor Jeff Williams and UTA President Vistasp Karbhari, center, welcome WNBA representatives of the new Dallas Wings professional women's basketball team that will play at College Park Center. Monday's press conferenceunveiled the new name of the former Tulsa Shock. 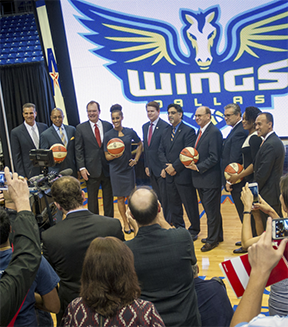 Read more about the Dallas Wings. Cast your ballot for the fall campus elections today, Tuesday, Nov. 3, in the University Center Gallery in the E.H. Hereford University Center. Fall elections are for Homecoming king and queen, UTA Ambassadors, and Student Congress senators. The Shorthorn, UTA's student newspaper, received the Associated College Press Newspaper's Pacemaker Award at the Fall National College Media Convention last weekend in Austin. Individual awards went to Susan Nguyen, first and second place, ad campaign, and fifth place, house ad; Elena Chudoba, third place, display ad; and Dalton Sessumes, fourth place, multimedia feature. The paper earned sixth place for multimedia story and seventh for newspaper special section and website/large school. Ryan Wagoner and Grant McKinley were editors of the submission that received the award in the four-year, non-daily newspaper category. Beth Francesco is director of Student Publications. The Homecoming Golf Tournament tees off at 8 a.m. Saturday, Nov. 14, at the Waterchase Golf Club. Enter by Friday, Nov. 6, at $50 per person. Mulligans are available at the course at two for $20. 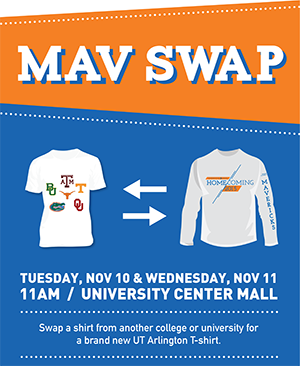 For more information, email campusrec@uta.edu or call 817-272-3277. The Blue, White, Light Up the Night Homecoming Parade needs your group, club, organization, family, and friends to enter for a chance to show Maverick pride and win a prize. Big lighted floats, marching bands, special guests, and UTA's traditional display of decorated and lighted golf carts make their way around the College Park District starting at 5:45 p.m. Saturday, Nov. 14. First and second place awards of $250 and $100 will be awarded to entries in two categories: University departments/departmental organizations and registered student organizations. Register your entry for the Homecoming parade by Wednesday, Nov. 4. 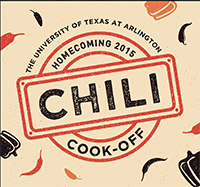 Put your chili-making skills to work at the annual Homecoming Chili Cook-Off. Teams start their concoctions early to serve to judges, then open their pots for samples noon-1:30 p.m. Wednesday, Nov. 11, on the University Center mall. Register online by Wednesday, Nov. 4. Call Student Affairs for details at 817-272-6080. 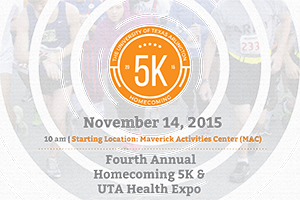 Sign up for the Homecoming 5K, which takes off at 10 a.m. Saturday, Nov. 14, from the Maverick Activities Center for a scenic route through the UT Arlington campus. Online registration is accepted through Thursday, Nov. 12, at runsignup.com. Proceeds benefit the Student Emergency Services Fund. After the race, stick around for the Health Expo with a variety of wellness vendors, foods, and activities. Read more details. If you know fellow Mavericks who would be good role models for incoming students and who would represent the best and brightest of UT \A’s student body, nominate them to be Maverick Orientation leaders. Send student names and email addresses to Meighan Burke, assistant director of New Maverick Orientation, at meighan@uta.edu. For details, go to uta.edu/orientation/leaders. Applications are due Thursday, Nov. 5. UT Arlington veterans will be honored on campus Wednesday, Nov. 11, for Veterans Day. A flag retreat ceremony is set for 5 p.m. in front of College Hall. The last day to drop courses for both undergraduate and graduate students is 4 p.m. Wednesday, Nov. 4. A grade of W will appear on your transcript. Undergraduate students who entered college for the first time in fall 2007 or later are limited to a total of six dropped courses during their undergraduate career. Discuss the impact of this when you meet with your adviser about dropping a course. Read more about this six course drop limit policy. A list of academic advising offices is available online. The schedule of classes for spring is largely complete but is still subject to modification. Plan to validate your course selections when registration opens. Priority registration opens Monday, Nov. 9. Check the registration timetable for your earliest date to register. Taste global goodies or test your worldly wisdom during International Education Week, set for Monday-Friday, Nov. 2-6. Most events are in the E.H. Hereford University Center. Taste global goodies at the International Fall Food Fair 11 a.m.-3 p.m. today, Tuesday, Nov. 3, on the University Center Mall. Asian Students share their stories of studying abroad noon-1 p.m. Wednesday, Nov. 4, in the Sabine Room. Author and budget travel expert Deidre Mathis shares her experiences as an African-American female traveling abroad, the importance of diversity in study abroad and international travel, and tips for how to travel abroad on a budget. Her keynote address is at 6 p.m. Wednesday, Nov. 4, in the Concho Room. Teams compete for prizes during World Trivia Night 6-7 p.m. Thursday, Nov. 5, in the Palo Duro Lounge. Students learn to be part of changing the world at the second annual Ubuntu Social Justice Conference on Saturday, Nov. 7. 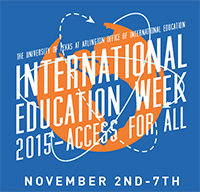 The Office of International Education hosts the week's events. Tail-Waggin’ Wednesday Students, faculty, and staff can take a break filled with unconditional love from therapy dogs. Free. 10 a.m.-2 p.m., sixth floor, Central Library. UTA Libraries. Guest Cello Recital Cellist Yuri Anshelevich performs. Free. 7:30 p.m., Irons Recital Hall, Fine Arts Building. Music. Friday Night Film: 'Southpaw' Rated R. Free popcorn. Concessions for sale. $1, $1.50 with credit card. 8 p.m., Rosebud Theatre, E.H. Hereford University Center. EXCEL Campus Activities. Movin' Mavs Fall Tournament Free. 9 a.m.-7 p.m. College Park Center. Also, Saturday, Nov. 7. Movin’ Mavs. Wind Symphony Concert Tickets. 7:30 p.m., Irons Recital Hall, Fine Arts Building. Music. Concerts and Recitals Trumpet Studio Recital, Monday, Nov. 16; Clavier Piano Recital, Tuesday Nov. 17; Guest Recital, Stephen F. Austin Wind Faculty, Thursday, Nov. 19; Bassoon Studio Recital, Friday, Nov. 20; UTA Symphony Orchestra Concert, Saturday, Nov. 21; Symphonic Band Concert, 3 p.m., Sunday, Nov. 22; Trombone Ensemble Concert, Monday, Nov. 23; Viola Studio Recital, Tuesday, Nov. 24; UTA Choir Concert, Thursday, Dec. 3; Flute Studio Recital, Friday, Dec. 4. All 7:30 p.m., unless noted, Irons Recital Hall, Fine Arts Building. Music. Volleyball Mavericks vs. South Alabama. Tickets $3 students. 6:30 p.m. Sunday, Nov. 15, College Park Center. Athletics. Deck the Mall Welcome the holiday season with music, hot chocolate, and lighting up the Library mall. Free. 7 p.m. Tuesday, Nov. 17, Library mall. EXCEL Campus Activities. Arlington Technology Association Xinbao Yu, associate professor of civil engineering, "Using Geothermal Energy to Remove Ice and Snow from Roads and Bridges." Light breakfast provided. RSVP. Free. 7-8 a.m., Room 100, Nedderman Hall. Arlington Technology Association. Disability Studies Lecture Robert and Schuyler Rummel-Hudson, “Fighting Monsters with Rubber Swords.” Free. Noon-1 p.m. Room 25, University Hall. Also, Catherine Kudlick, “Disabling Cures: Rescuing History’s ‘Incurables’ from the Clutches of the Present,” Nov. 19. Disability Studies. Food for Thought Dietitian Allison Dominguez, what to eat before and after you exercise. 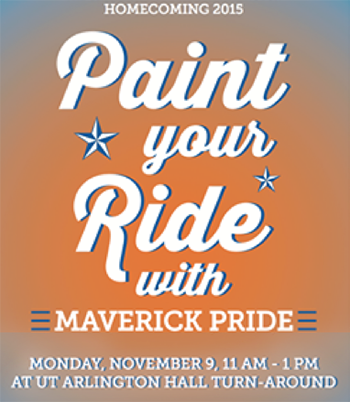 Noon-1 p.m., Room 213, Maverick Activities Center. Campus Recreation. Panel Discussion: World Class Championship Wrestling Panelists examine the World Class Championship Wrestling events in North Texas in the 1980s. Panelists are exhibit photographer Cirrus Bonneau, curator Oliver Lee Bateman, former WCCW wrestlers "Cowboy" Johnny Mantell and "Iceman" King Parsons, and former pro wrestling personality Allan Saxe, associate professor of political science. In conjunction with exhibit “Ringside: Memories of World Class Championship Wrestling.” Free. 2-3:30 p.m., sixth floor parlor, Central Library. UTA Libraries Special Collections. Mathematics Colloquium Series Patrick Shipman of Colorado State University. 3 p.m., Room 311, Pickard Hall. Mathematics. Flying with SOFIA M.J. Tykoski shares her story of flying on NASA's Stratospheric Observatory for Infrared Astronomy (SOFIA). Tykoski is an eighth grade science teacher in Wylie and received the 2013 Butler Award for Excellence in Science Teaching. Free. 5 p.m. reception, 6 p.m. lecture, The Planetarium at UTA. Science, Planetarium. 2015 Breast Health 101 Symposium Register online; code BH101. Free. 11 a.m.-1 p.m., Maverick Activities Center. College of Nursing and Health Innovation. Safe Zone Ally Training Register online. 9 a.m.-noon Monday, Nov. 16, Guadalupe Room, E.H. Hereford University Center. LGBTQA Program. Goolsby Leadership Lecture Mary-Uhl Bien of Texas Christian University, “Leadership in the Workforce.” Free. 7 p.m. Tuesday, Nov. 17, Bluebonnet Ballroom, E.H. Hereford University. Goolsby Leadership Academy. Focus on Faculty: Traci Freling Traci Freling, associate professor of marketing. Free. Noon-1:30 p.m. Wednesday, Nov. 18, sixth floor, Central Library. UTA Libraries. Anderson Sports Performance Lecture Series James Pollifrone, president of Arlington Orthopedic Associates, “Treating the Whole Patient: Case Studies From the Athletic Arena to the Weekend Warrior.” Noon Wednesday, Nov. 18, Lone Star Auditorium, Maverick Activities Center. Kinesiology. Genomic Core Facility Info Seminar Learn about next-gen sequencing and how Illumina MiSeq desktop sequencer can enhance your research. Register online. 8:30-11:30 a.m. Thursday, Nov. 19, Room 227, Pickard Hall. Genomics Core Facility, Biology. Transgender Day of Remembrance Finn Jones of Transcendence DFW, followed by a candlelight vigil. 6-8 p.m. Thursday, Nov. 19, Student Congress Chambers, E.H. Hereford University Center. LGBTQA Program. Cross Country champs: The men's cross country team, top, won its third conference championship in four years Saturday, Senior Eric Ojeda, middle left, earned the individual champion at the Sun Belt Conference Championships. Chris Myers, middle center, was named Freshman of the Year, and John Sauerhage was named Men's Cross Country Coach of the Year. The men's cross country team claimed its third league title in the past four years and senior Eric Ojeda earned the individual champion at the Sun Belt Conference Championships on Sunday. John Sauerhage was named Men's Cross Country Coach of the Year. All five UTA point scorers placed among the top 20 as the men finished with a total of 52 points. Ojeda netted a time of 25:17.8 to win the race by 13 seconds. The senior became a first-team All-Sun Belt Conference pick for the second consecutive season. Chris Myers was named Freshman of the Year. He and Grant Copeland earned spots on the All-Conference second team. The UTA women, the 2014 conference champs, placed third with 84 points. Gabriela Alfonzo earned first team honors, while Katelyn Hayward made the second team. 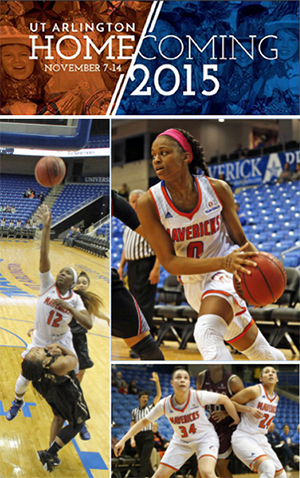 The UTA teams head to the NCAA South Central Regional on Friday, Nov. 13 in College Station. Read more about the SBC Cross Country Championships. UTA claimed a five-set victory over Troy at College Park Center on Friday night and 3-1 over Louisiana-Monroe on Saturday. The Mavs hit the road for Louisiana-Lafayette on Friday, Nov. 6, and Louisiana-Monroe, Saturday, Nov. 7. The SBC Championship Tournament is Nov. 20-21 in Statesboro, Ga.
• The Movin' Mavs Fall Tournament play Friday-Saturday, Nov. 6-7, at College Park Center. See the schedule. • The women’s basketball game against the Baylor Bears in the 2015 Preseason WNIT Friday, Nov. 13, will be broadcast on Fox Sports Southwest Plus. UTA's trip to Kansas State on Dec. 3 will be on Fox College Sports-Central. Fox Sports Southwest Plus is available to most cable and satellite companies on the channel's alternate station, as well as on the Fox Sports Go app. • Lady Movin’ Mavs freshman Rachel Kroener placed sixth in shot put at the 2015 World Championships in Doha, Qatar. She will compete in the 2016 Paralympic Games in Rio de Janerio, Brazil, in fall 2016. • Anthony Walker was selected by the Fort Wayne Mad Ants in the third round of the NBA D-League Draft on Saturday.